Altars, as commonly considered, are not typically part of contemporary Jewish culture. One Sabbath my orthodox Jewish friend from Israel gathered us around our Sabbath table, and spoke of it as an altar. I learned that when our temple was destroyed in 70 AD our homes symbolically became our temples and our Sabbath tables our altars. In my research, I found that in early Jewish history a Tabernacle was built by Moses and the children of Israel following the directions of the Lord. The directions are found in Exodus, chapters 25-29. The Tabernacle contained several components, including the Altar of Burnt Offering, the Bronze Laver, the Incense Altar, the Seven-Branched Lamp Stand, the Ark of the Covenant, and the Table for Loaves. [www.jewishheritage.net]. 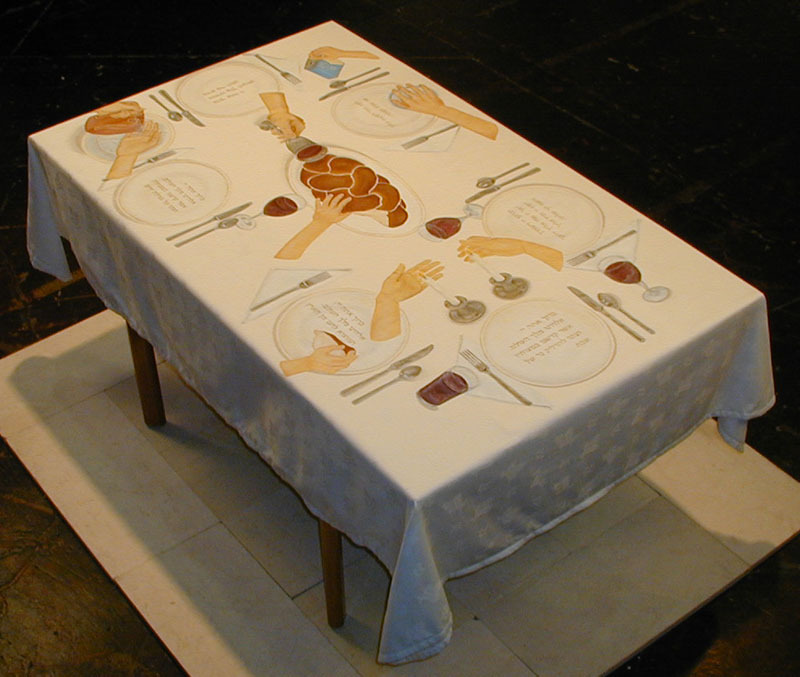 In contemporary Jewish culture, as represented in this artwork, we gather around a Sabbath table to participate in this ceremony. Welcoming the Sabbath consists of preparing the home and self by giving to charity, kindling the Sabbath lights, blessing the children, reciting the blessing over the wine, ritual washing of the hands and breaking the challah as we sing the blessing over the bread. To complete the Sabbath ceremony, we thank God by reciting the blessing after the meal for providing us with good food, our family and friends, and the Sabbath itself. This Sabbath table altar signifies holy community with the Jewish people everywhere. It is said that Jews do not keep the Sabbath, the Sabbath has kept the Jews.